Welcome to this month's installment of Dear Urbaneer, where we answer questions that have given our clients pause. This time around, we look at life beyond the purchase and how you can really optimize your homeowner experience. After a lengthy search, with your guidance we were able to find our perfect property. The whole intense process of finding, buying and moving in is now behind us, and we feel, well, a little lost. We are keen to mould our home to suit our needs and to reflect our personal character. We also want to embrace the next stage of home ownership and optimize the experience. Where to start? What to do? What you are experiencing is not uncommon. The bid for the perfect home is a journey often characterized with intense highs and lows, that for many (especially in the City of Toronto) can span several months (if not years). Living that experience can make it difficult to transition into the next phase of home ownership. In fact, that transition can seem overwhelming, especially if there are a million things that you’ve dreamed of doing when you are finally within those coveted walls. Maybe you want to renovate. Maybe you want to expand your home-based business, or start a family now that you have the space. Maybe you are keen to plant a real garden for the first time. Or maybe all of these and more! What can be done when your to-dos seem too many and too diverse? 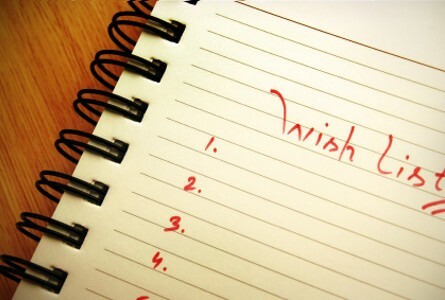 Harken back to the most basic of organizational tools - the list. You work through a to-do list in your professional life and personal tasks; try adopting the same principles when it comes to home ownership, in order to help your home (and your life) run swimmingly! 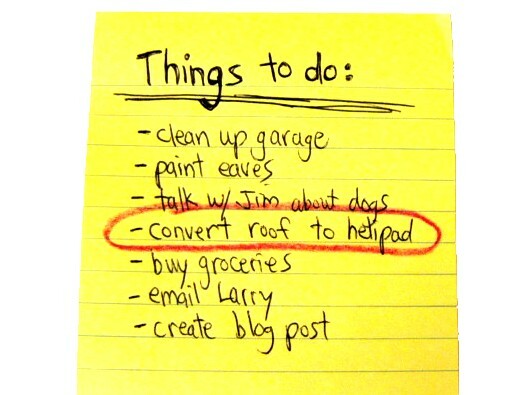 Don’t get into the habit of jotting multiple lists down either (a la sticky notes in every nook and cranny). House your daily list in a central location, where it is visible to you and your family members. Don’t worry if your lists are not comprehensive; this is about evolving into a habit that will let you identify your goals within your home (i.e. redecorate or re-purpose a specific room, cleaning, repairs, outsourcing, etc). It’s also about setting time aside every day (or near to every day) for specific thought about how you’d like your household to run- and what you’d like it to look like. Don’t forget there is a sort of partnership between you and your property; it's providing you shelter and potential asset growth. You are providing it TLC through maintenance and style. Now that you’ve established the habit of list making, you can sub-divide. When one thinks of repairs, one tends to harken to major things, perhaps structural or seriously damaged. These may, in actual fact, need to be outsourced to the experts. However, there is no doubt that an ongoing cycle of small repairs- which if attended to as they emerge- can make you feel like you are spinning your wheels. This can be especially true if you have children or pets, who have a delightfully charming way of testing the durability and limits of your housing structure and the belongings contained therein. All that to say, compile these to-do’s (i.e. burnt out light bulbs in tricky light fixtures, wobbly chair leg, clackety fan in the bathroom, etc.) and set time aside (weekly or bi-weekly) to attack and conquer. Not only are you more efficient with your time that way, but you can crumple that list with verve every time you are done! 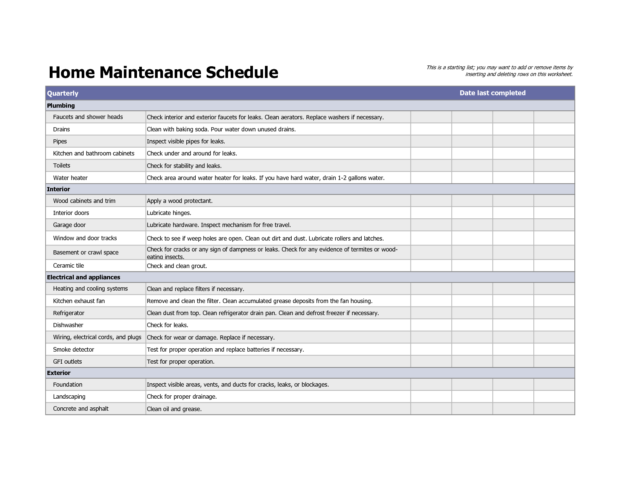 Make a habit of planning ahead for regularly scheduled cleaning and maintenance. There are tasks that only need your attention annually or quarterly, so they often slip through the cracks. Schedule reminders in your devices for when it’s time to consider preparatory yard work, furnace servicing, duct cleaning, air filter changing, etc., so that you can't fall behind on these less glamourous- but very important- nuggets of home ownership. If you could alter something (and everything) in your home, what would it be? Are renovations a dream or otherwise in your mind’s eye? Make this list with big jobs and small, with associated timelines and priority. For jobs that are feasible in the short term, break them down into greater detail, with rough cost estimates, contacts and references for inspiration. 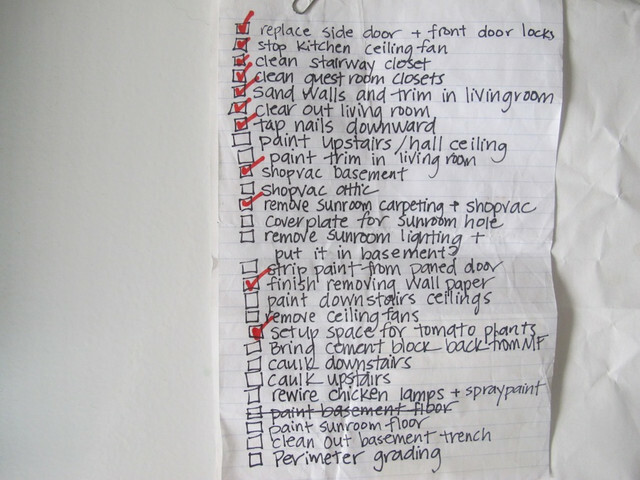 Break the list down according to tasks you intend to DIY and those that you’d outsource to a contractor or designer. Given that renovations can be a rather enormous task that requires financial, emotional and, at times, relationship fortitude, there is a whole other directive for list-making, which urbaneer will explore in a subsequent post- stay tuned! It’s human nature to find flaws and areas of improvement, but part of deriving satisfaction from anything is to find the positive in your surroundings. Always take a few moments, on regular basis, to reconnect with the reasons you fell in love with your home in the first place. Do you love your home? Do you remember why? Are you at loose ends as to how to boost your overall homeownership experience? At urbaneer.com we understand that homeownership is a relationship like any other, fraught with nuance, hard work and reflection. We delight in helping our clients find properties that fit their needs and dreams in just the right way. We’re here to help!